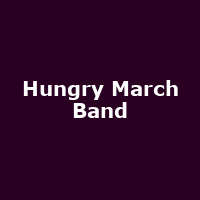 "Roaring out of Brooklyn comes the Hungry March Band, NYC's legendary street brass march band in the anarchic style that has become their trademark. Put on your dancing shoes and break out the fancy threads because they've got a party going on - a blazing parade of flesh, blood, steel, brass and wood. They are the music of the people! HMB musical repertoire consists of original compositions written by band members as well as scores selected from our multi-cultural world community. These songs range from New Orleans street bands, European brass traditions, Gypsy/Roma classics, wedding brass bands from India, the jazz world and the global community of NYC. The band is an ever evolving musical experiment influenced and inspired from Brooklyn's backyard with Latin flavor, punk rock noise, hip-hop beats and music of the streets."